The picture left may resemble one I snapped a couple of years ago whilst waiting to enter my Argus (now Cape Town Cycle Tour) start chute, but the event we were gathering for would be a very different experience. Bush fires had ravaged the Cape Peninsula for more than a week, and in some places were still raging. The damage to hillsides surrounding the route, and the need to keep access roads open for emergency services had left the ride organizers few choices: cancel the event; or drastically alter the route. 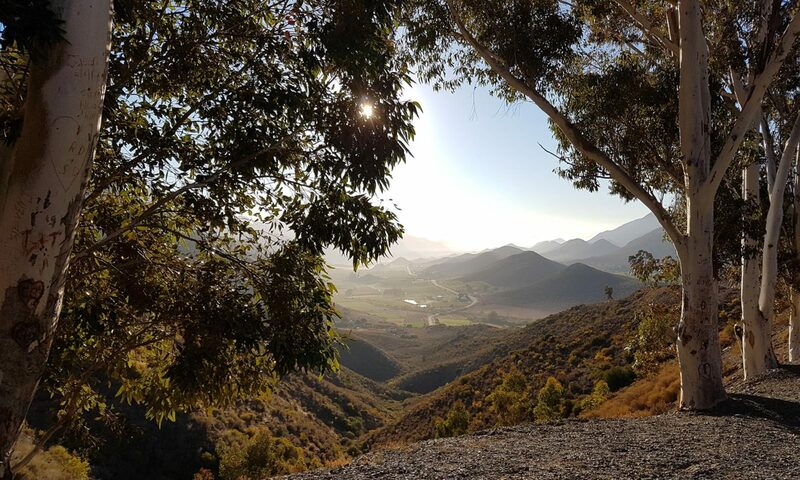 The latter option posed problems of it’s own – the usual standby route over Ou Kaapse Weg was also extensively burnt, with ash and smoke still lingering in places over the pass. Even if it had been totally safe to ride, it would not have been pleasant sucking down lungfuls of acrid smelling with every pedal stroke as we battled up the long climb. Rather than cancel, the organizers announced a fore-shortened event of 47km which they had declared as a Solidarity Ride to show the city’s support for the tireless and unceasing efforts of the fire crews. In theory then, we were queuing up for a leisurely social jaunt to the end of the “blue route” (as the M3 is known) – should be back for breakfast in a couple of easy hours riding. Of course not one of the cyclists gathered in the earlier seeding groups saw it even remotely that way – myself included if I’m honest. We’d been handed a golden opportunity to spin as hard as we damn well liked up Hospital Bend and Edinburgh Drive without any fear of burning our legs out too early. And whatever we had left in the tank we could use to scorch as much tarmac as possible in the opposite direction back into the city. And sure enough, that is exactly what happened. The gun sounded and the herd charged. With no chance to spin and warm-up prior to the race, my cold muscles ached and screamed as we surged up onto the ramp and out of the city. At some point before we turned onto the M3 a flying peloton passed us going the other way. Hard to tell whether it was the Elite’s or one of the top seeded groups, but they were seriously shifting. We weren’t traveling nearly so fast, but I’ve still never crested out at Wynberg ready for the run down towards Tokai with my Garmin showing such a high average speed – I think it was still clocking 25kmh or maybe 28kmh. That’s not especially fast by most standards, but it’s pretty decent for me – more than enough to broaden my stupid grin even further. This was fun – I was thoroughly enjoying the freedom to ride as fast as I liked with no concerns about pacing myself for later. The rest of the ride was taken in a similar spirit – short of breath, legs spinning furiously and loving every minute of it. At the end of the run down the M3, rather than swinging left to Muizenberg we turned right and looped around onto the other carriageway of the freeway back towards the city. I started out drafting a couple of Tandems, but as the hill started to pick up they slowed. I found myself pulling solo and pulling hard. I wasn’t solo for long though, clearly my 40+km/h pace was attractive to riders around me and within meters I found I’d acquired a drafting train of my own. My speed dropped as we climbed up the back side of Wynberg hill, in fact to quite a crawl at one stage but luckily it was a short stretch. I’d lost my start group early but was trying my best to keep up with every 3C numbered jersey I could see around me. I had no idea whether I was mid-group, or had slipped down to the tail. Anyhow, it didn’t matter. Soon enough we rejoined the N2 at De Waal drive and were greeted with the stunning views out over Cape Town, the harbour, and Table Bay beyond. I’ve seen it dozens of time from a car, but never by bike. It was a special moment, but all too brief. With bikes all around, speeds rapidly picking up speed to the 60s and above on the down slope, and swirling winds pushing and dragging us all over the highway there was no time for sightseeing. Utmost concentration was required to hold a line as we raced back into town. 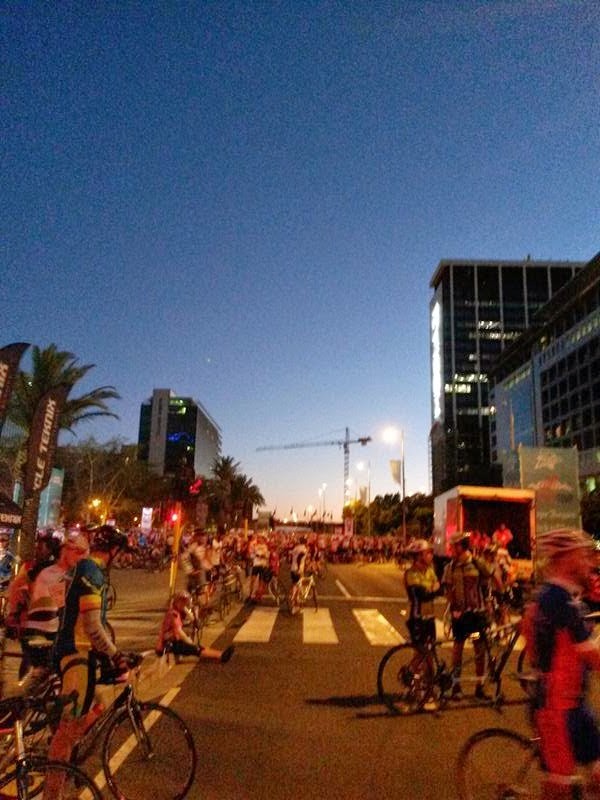 The best was yet to come – charging headlong through closed off streets, buildings rising all around, leaning over hard left and right as the route swung around city blocks eventually ejecting us onto the elevated freeway back towards the finish at Green Point stadium. In one smooth movement, our bunch compressed together to navigate a roundabout, and fanned out again just as rapidly before a final dash to the line. In a blur of wheels and pedals, it was all over. My Garmin was reading 1:30 as we crossed the line – pleasingly my official time shaved a few seconds off that to take me under the one and a half hour mark (1:29:56). Not bad for a slow paced long distance rider. My 8th Argus may have been the shortest, but it was also quite possibly one of the most fun. I’ve heard a number of people question whether the ride organizers did the right thing rather than cancel the event outright. For myself, there was no doubt. This year’s Argus will live in my memory for many years come.